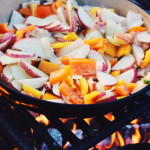 An easy, cast iron breakfast potato recipe using red potatoes, onions and bell peppers. This simple breakfast potato recipe also makes for a great dinner side. 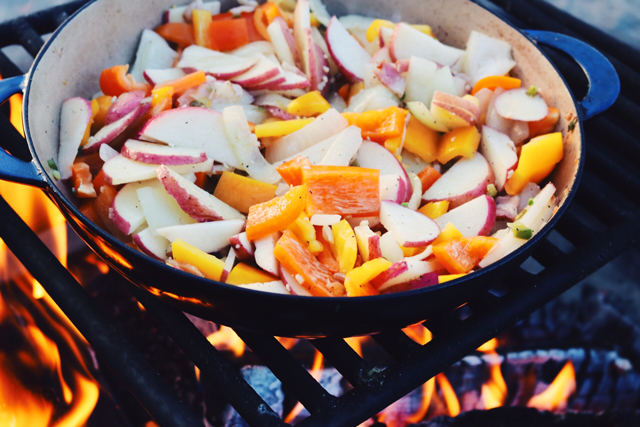 An easy, cast iron breakfast potato recipe using red potatoes, onions and bell peppers. This simple breakfast potato recipe also makes for a great dinner side. Make an extra serving in the morning and keep the leftovers for a tasty side dish. An easy, one-pan breakfast hash with cubed sweet potatoes, onions, sausage and eggs. For those that enjoy an extra kick of heat - use diced jalapenos. Slice the red potatoes into equally sized slices and add to the pan once butter has melted. Cover the potatoes and cook for about 5-7 minutes while stirring occasionally to keep the potatoes from burning. After 5-7 minutes, add the onions, bell peppers, and jalapenos and continue to cook while covered. Add salt and pepper to taste. Remove pan from heat and serve! Plan ahead and pre-slice your vegetables for an even easier morning of cooking.